The customer experience is no longer limited to a single interaction. Today, the customer experience is an extended process that spans the lifetime of a customer’s relationship with your business. These relationships can last for the length of one phone call or many years. That’s why making each touchpoint of the customer experience satisfying is an imperative facing organizational leaders. How do organizations ensure a quality customer experience? It starts with the employees who interact with customers every day. A positive employee experience works hand-in-hand with a satisfying customer experience. 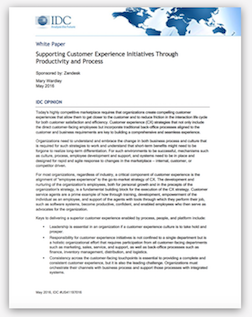 A new research report authored by IDC analyst Mary Wardley discusses the importance of the customer experience, and the impact a good agent experience has on that goal. Wardley also takes a close look at how Just Eat, Medidata Solutions, and NatureBox have effectively utilized tools to support service and contact center agents in the pursuit of delivering a superior customer experience. Describing the modern customer environment. Today, customers engage in extended relationships rather than single interactions with organizations, creating the customer experience. Moreover, the channels that facilitate communication between customers and organizations are evolving and proliferating. Detailing the top three important factors in achieving customer support, from both the customer and support agent perspectives. Analyzing the agent experience and its relationship with satisfying support. IDC explains what leaders need to do to improve agents’ efficiency and retention, a company-wide effort. Explaining the key role integrated internal systems, namely software, plays in a satisfying customer experience. Here's your copy of Supporting Customer Experience Initiatives Through Productivity and Process, IDC: Supporting Customer Experience Initiatives Through Productivity and Process.